Since I was elected Chairman of the Republican Party of Virginia (RPV), we’ve been busy at headquarters working to rebuild RPV into a much more aggressive, pro-active Party that is run from the grassroots up. To that end, I implemented a “First 100 Days Plan” to kick-start our Party and lay the initial foundation and infrastructure on which to implement a long term strategy for victory. A content-packed weekly email update, highlighting all of our federal candidates, with facts and information to arm the grassroots with talking points and facts to get our message out. Coordinating and funding our EDO (Election Day Operation) efforts. Operating an election day statewide war room. As a Party, we will raise and spend over $4 million in hard-federal dollars for our 2008 Victory efforts. Because we have been working day and night on activity related to November 4th, I neglected to report back to you -- the grassroots -- on our successes with the First 100 Days Plan. Well, during the Redskins game Sunday, I found a few minutes to dust off the draft I’ve had on my desktop and wanted to get this out to you sooner rather than later. It has been an honor to serve as your Chairman over these last several months, but that time has not been without its challenges. Rebuilding the Party has turned out to be a far more difficult task that any of us had anticipated, particularly in the midst of a presidential campaign like we have never seen here in Virginia. But notwithstanding, just like the Party I’m proud to represent, I am not one to shrink from a challenge. I set forth an ambitious 100 Day Plan during my campaign because I believe in setting goals and measuring progress. With the first 100 days of my chairmanship now in the books, I am proud to say that we have accomplished what we set out to do in the first few months of our new administration. I promised to bring bold leadership, new energy, and new excitement to our Party. Indeed, we have been a much more bold and aggressive Party, and with all the enthusiasm surrounding this year’s campaign, our volunteer rolls are way up; our small dollar fundraising is hitting levels not seen in years; and, among other things, we are turning out tens of thousands of people at rallies all around the Commonwealth. Our job after November 4th is to keep that energy and excitement going into 2009 when we face perhaps the most important state election we’ve had in decades. Trust me when I say that we are just getting started. As we face the last days of a vital presidential contest, we are putting it all on the line. As an active, committed member of our Party, it is important for YOU to know that your RPV staff and chairman are working as hard as you are (and maybe sleeping less). Our shared commitment is the key to ensure that all of our hard work pays off on this Election Day, and the next. Thank you again for your commitment, sacrifice, and support of our Party. The Party will not be successful without the grassroots being successful, and I’m proud of everything you have been doing these last several months, in spite of so much working against us this year. Below are some highlights in each area as to the progress we have made thus far. There is much more to be done, of course, and working together we will succeed in winning again. · We worked hand-in-hand with both the Attorney General and Lt. Governor to continue and enhance the AG/LG/RPV challenge to work to double the membership of our units. This initiative – started prior to my chairmanship – has been a tremendous success in adding over 3000 new, active and energized Republicans to our grassroots base at the local level. · We have hired 5 full-time RPV field staffers to ensure we have the strongest grassroots team our state party has ever seen. Our staffers are actively attending meetings, listening to our units, and helping serve as the link and sounding board for our Party members at every level, but in particular, serving the grassroots on a full time, daily basis. · Our field staff is a constant presence at local GOP meetings and events, actively engaged as a team member with units in advancing unit and district goals and objectives, as well as having established a strong line of reciprocal communication between local GOP leaders and RPV. · RPV field staff is meeting and working with Republican clubs like the College Republicans, Young Republicans, Teenage Republicans, in an effort similar to the one we are doing with local GOP units. For example, we opened up the AG/LG/RPV Challenge to these clubs. · RPV Staff has begun polling units to find out what each unit is doing well, and what they need help with. Using this information, RPV will develop a best-practices document to share ideas that lead to successes/strengths in units and clubs, and to develop RPV programs to address common weaknesses. · The RPV has restructured our ethnic/cultural minority outreach group (formerly know as the “Welcoming Committee”) to make it more effective in reaching out and actively promoting our shared values with minority voters, to produce results in specific races on Election Day. Under the leadership of Chuck Smith, who I asked to continue to serve as Chairman of this committee, we have made specific inroads and laid plans for outreach to the African-American community, Hispanic community, Asian community, and have established a new outreach to the Arab-American community. · The RPV has made voter lists a priority, and worked to quickly move updated voter information that we receive from the State Board of Elections (SBE) to our units and candidates, such as the February GOP Presidential Primary data, which was made available to units just days after the SBE released that data. · We have worked closely with the Republican National Committee to integrate new voter data into Voter Vault, a crucial element that allows for earlier implementation of grassroots activities such as voter id and voter contact. The McCain and Victory efforts this year expressed a preference for Voter Vault, so we leaned on that system as our primary tool for the 2008 election, but are working to build our own system, catered to the unique needs of Virginia campaigns, that will be ready prior to the 2009 campaigns. · We have published a Unit Chairman Manual and Precinct Captain Manual to all District Chairs to distribute to their local committees. These documents include helpful information and tips, as well as best practices. · We have established a Unit Chair Caucus for local unit chairs to come together, network, and learn from one another, as well as keeping this important group of local leaders directly plugged into the RPV organization. Our first meeting will be held at this year’s Advance. · We have worked to fundamentally reshape our relationships with our donors. The Party must have value to those we solicit; people want to know that the investment – no matter how big or small – that they are making will pay dividends in electing Republicans that share our values to office, not simply raising money to keep RPV in business (we’re not here to stay in business, but to elect Republicans). · We have undergone a complete review of RPV fundraising and expenditures, seeking out new opportunities for fundraising, and identifying places we can cut or reduce spending. · We have multiplied our small donor base and grown our list exponentially through direct mail, telemarketing, and online solicitations, all the while expanding our large dollar donor base, insuring a less volatile and more steady flow of revenues over the long term. · We have hired a new direct mail firm and have been successful at growing our House File (fundraising list) for the first time in years. · RPV fundraising since June has exceeded funds collected over the same period last year. · The Party’s debt has been slashed by over 65% and is on track to be paid off soon. · We have canceled lucrative contracts with contractors and have streamlined and outsourced many RPV operational functions to conserve resources. · We raised over $165,000 for the Republican National Convention efforts, with proceeds over $80,000 to use to help fund our operations and elect GOP candidates. · We have planned and are continuing to plan creative events, such as the events held at the National Convention for our Virginia Delegation featuring Pat Boone and breakfast with actor Jon Voight; an event tonight with conservative rising star, South Carolina Governor Mark Sanford; a (car) track event in the spring; and more coming soon. · We have implemented a new e-mail fundraising program that, in just recent months, has raised over $57,000 from over 450 contributors. · The RPV and Jim Gilmore for Senate campaign established a joint fundraising committee, which successfully raised the money for the first major television buy for or Senate nominee this year. · Neither I, nor my staff has subcontracted or will subcontract work to family members, and all prior contracts that fell into this category of current or immediate former staff have been canceled. · RPV is preparing to unveil a major redesign of the RPV website. The new “RPV.ORG” will rival any state party web site in the nation, and provide us with a greater ability to enable thousands of new people to get involved in the process, while using technology to organize them. In addition, the new site will provide up-to-date information to voters about our Republican candidates and vision, as well as serve as a community for our grassroots activists and members at all levels to share and exchange information to make our Party even better. · Yet, more than just a website, the new technology platform of RPV.ORG will allow for the creation of web sites for every unit and Republican club in Virginia, and candidates, so each Republican district or unit will have the ability to create a fresh, cutting-edge web site to help build their membership, promote their events and activities, and connect with other activists throughout Virginia. · The new technology platform will also provide a vast network of email lists, from a statewide list, to local unit lists, all managed from the same technology platform, integrated into the websites. In addition, the state Party will be able to push content to local unit websites and build a powerful statewide email list to trigger instant action from the grassroots with the new platform. · Important news and relevant policy positions of our Republican legislators and candidates will be readily available and accessible to party members both on the RPV web site, as well as on local web sites that choose to receive this content. This will help ensure that local GOP web sites build regular visitors who routinely check for updates and breaking news. · RPV has worked to ensure that we receive – as quickly as possible – the most up to date statewide voter file updates to ensure that we can speedily get this valuable information to the units and candidates who need it. We are further developing our own proprietary voter information databases that will maximize the use of the information we have collected to provide for even better targeting, communication and turnout of our voters. · RPV is heavily involved in an exhaustive effort with the RNC to re-work and refine the voter data that is in the current Voter Vault program. Making sure this data is reliable is the foundation to future data files which must be seen as trustworthy by the candidates and committees who reply upon them. · RPV has appointed a technology/new media committee to help collect and suggest ways to make sure we close the gap and surpass the Democrats in the implementation of new media and new voter outreach technology. · As previously noted as part of our grassroots efforts, Young Republicans (YRs) and College Republicans (CRs) have been a focal point of RPV. Most notably they were added to the AG/LG/RPV challenge and given incentive to create new clubs and build membership at existing clubs, with very promising results thus far. · Young Republicans in the workforce and on college campuses are being actively recruited for input and encouraged to take leadership positions in the Party. Social networking both in person and on the internet will play a key role in communicating our values and our actions to voters. · Through my personal scheduling as well as in the activities of the RPV field staff, events involving young voters have a special priority on our schedule. · In order to get organized as early as possible for the crucial 2009 elections, we have already identified the most vulnerable Republican House seats for the 2009 that we must protect, as well as the most promising Democrat-held House seats that are vulnerable to a GOP takeover. · Working with the Speaker, Majority Leader and others in the House GOP caucus, RPV has been actively involved in early recruitment, to make sure that we field the strongest possible challenger candidates to reclaim seats lost in recent election cycles. · RPV has been actively working with the offices of the Attorney General and Lt. Governor in our communications efforts. It is critical that our GOP team speaks with a unified voice in opposing the Democrats’ high-tax agenda, and effectively thwarts their attempts to frame the 2009 election as one where the Republicans in Virginia are divided and unable to lead the Commonwealth. 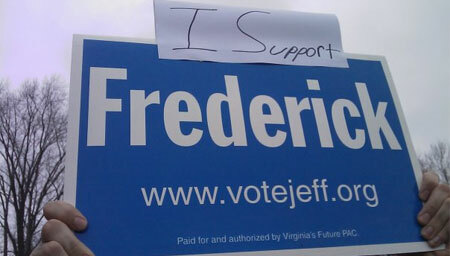 This tactic was successfully used by Mark Warner to avoid blame for his fiscal incompetence. · The new RPV.ORG web site will further be utilized in order to establish the “Majority Blog” that will allow key members of the Republican team to be actively involved with the recruitment and support of our 2009 legislative slate.